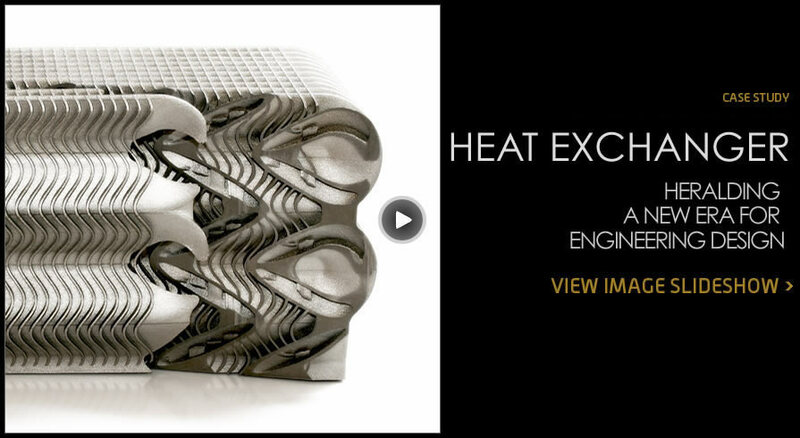 3T RPD and Autodesk Within have teamed up to produce this radical heat exchanger that heralds a new era for engineering design. This concept has been conceived, designed and built as a partnership between the two companies. The design highlights some of the key attributes that are now possible using the Autodesk Within Consulting and 3T’s DMLS expertise. The overall device is composed of a large number of repeated sub-elements. Each sub-element has been optimised so the final design can be formed into almost any shape the designer wishes. This is important, for example, in the case of racing car components where the space available is rarely the convenient rectangular shape of a normal component. Not only does the design have the potential to fit a wide range of sizes and shapes, it is optimised for internal and external performance. Inside each of the tubes (which are a tear-drop shape for manufacturing and heat exchange considerations), you can see a cleverly designed series of struts (Turbulators), created to increase internal surface area and disrupt the flow of the cooled fluid to maximise heat transfer. The outside form has been designed to increase the cooling surface area and maximise the work done by the cooling air as it passes through the device. This has been achieved by integrating cooling fins into the design. Though clearly a concept, this design has many of the attributes expected of a performance heat exchanger. The primary aim however is to stimulate the thinking of design engineers of performance components and drive forward innovation within the British engineering and manufacturing industry. This heat exchanger is featured in the August 2010 issue of TCT Magazine.